These are tricky times for comedians. Gone are the heady years when a good set at “Catch a Rising Star” and a thumbs-up from Leno or Letterman automatically led to a network sitcom. Our fragmented era of podcasts and web series may offer more outlets, but not necessarily more careers. At the same time, established comedians find themselves attacked for their behavior (Cosby), their material (Kathy Griffin, Roseanne), or both (Louis C.K.). Meanwhile, Americans have become so virulently polarized, taking on any serious socio-political topic risks losing half the room. 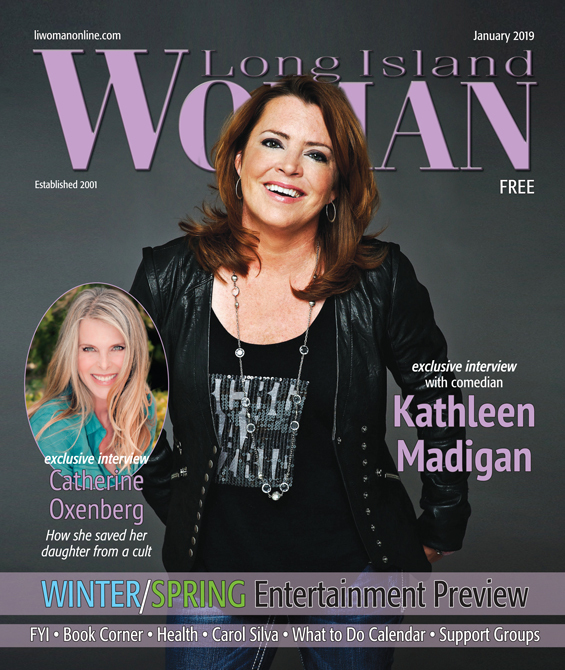 Through it all, however, veteran comic Kathleen Madigan endures and thrives. A former journalist, she’s not averse to picking at controversial topics (e.g., her celebrated bit on the still-missing Malaysian Flight 370), yet fans of all political stripes accept the Missouri-born Irish Catholic as a one-of-us, blue-collar type in the vein of Ron White and Bill Engvall. She’s entertained the troops in Iraq and Afghanistan, but you won’t find her on a Fox News panel anytime soon. Where you will find her, week after week, is in concert halls across America doing her “Boxed Wine and Bigfoot” tour, which reaches Huntington’s Paramount Theater April 12. Even offstage, Madigan speaks frankly about her background, material, and career choices—especially her continued pursuit of stand-up while so many in her field jump to television and movies at the first opportunity. “I never wanted a sitcom, she notes. “I don’t want one, and still would say `no’ to one. For a while at ABC, Marcy Carsey and Tom Werner ran the ship, and they were big fans of women. They helped Roseanne and Brett Butler. And Ellen’s show ran on ABC. But then Carsey-Werner kind of went away. The people now in their 60s—Ray Romano, Brett—that was the last group where stand-ups just got a sitcom (except maybe Kevin James, who’s my age). But ABC was the only option. Black is one of the few comedians for whom Madigan has written material: “he had this big thing in Montreal, and we had to put together something quickly and write jokes towards a theme. Since Lewis is one of my best friends, I can write in his voice.” Another was the late, great Garry Shandling, when he was hosting the 2004 Emmy Awards. Recalls Madigan, “I was a fan of Garry’s. He was crazy, but that’s okay. Not harmful crazy. I mean, comedians tend to throw around words that aren’t politically correct, so `crazy’ might get me in trouble. But he was so smart and so funny and so nice. Asked if that stance might make fans believe she leans politically to the right, Madigan responds, “There’s a show on Fox called The Five. And they’re always trying to find comedians to go on there. I’ve said `no,’ like, 50,000 times. I’m like, `Are you high? I’m not gonna support that.’ Lewis won’t go on it, either. They have a tough time finding comics who even would agree to jump into that because we’d be making their show better. They could easily get serious left-wing people who could argue a point in an intelligent way. But they want entertainment. I guess for a comedian who has nothing else to do and wants to help Fox, have at it. But my fans probably see me in the same way they think of Ron [White]. People can be amazed that he’s…I don’t know if you’d call it `liberal.’ Maybe practical or just more in the middle. But for me, I don’t even know enough…I mean, to really understand healthcare and what is the answer? I have no idea. Asked if the ugly behavior of Bill Cosby and Louis C.K. should affect our appreciation of their skills and older work, Madigan answers, “You’d have to decide whether you like those comics to begin with. Whatever Bill Cosby has done—his comedy was always too slow for me. I don’t have the patience. I’m not a long-story person; I want bam bam bam bam bam! But I guess if you were a Cosby fan…could you go backwards in time? He’s probably still funny to those people. Do you recall your first stand-up routine? I know I did some jokes about the Olympics because it was an Olympic year. But otherwise, I don’t remember. Didn’t you used to smoke? I quit a long time ago. I just stopped. How do prepare just before a show? I usually just sit there drinking a cup of coffee. Zanies in Nashville. [Mark Ridley’s] Comedy Castle in Detroit. Florence and the Machine, Mumford and Sons, Anita Baker, Arcade Fire, Jann Arden. Those are what I listen to the most in my house. Most recent books you’ve read? Nick Tosches’s Hellfire: The Jerry Lee Lewis Story, and David Corn’s Russian Roulette: The Inside Story of Putin’s War on America and the Election of Donald Trump. I still love Arthur. If it’s on, I still watch it. Or anything by Christopher Guest—especially Best in Show—but anything with Fred Willard in it. As a kid, I liked M*A*S*H. Now, I don’t even watch regular TV; I watch Netflix. So there’s Queen of the South and Ozark and a British thing called Broadchurch. Being on the road and always working at night, I don’t even know what’s out there.